Our paper "Intertidal resource use over millennia enhances forest productivity," which was published in Nature Communications last year has won the W. S. Cooper Award for outstanding contribution to the fields of plant ecology and biogeography. To read more about the Ecological Society of America award and our research click on the image below to access a short story featured in The Ring. My research on historic fire activity in the Great Bear Rainforest located on the Central Coast of British Columbia was recently featured in the New York Times. Click on the image below to read the whole article. A story about our new paper examining human and climate drivers of fire activity in a British Columbia coastal temperate rainforest is featured on EurekAlert. Click the image below to access. Our research is featured on Quirks and Quarks!! Click here to listen to Dr. Andrew Trant discuss how millennia of traditional land use practices by First Nations have made forests along the Central Coast of British Columbia more productive. For a more detailed description of our findings, check out our Nature Communications paper (link below). Shanna Baker's Piece The Secret World of Bog features my research on B.C. hypermaritime bogs. Her photo essay also nabbed the award for best photojournalism at the 2017 Canadian Online Publishing Awards!. Click on the image below to access the story. First Nations' traditional way of life good for ecology: B.C. study. New article in the Globe and Mail on our Nature Communications paper (see link below). Click through image to read the full article. Photo Will McInnes/Hakai Institute. Our new study on how people have enhanced, not degraded, the environment over 13,000 years is published in Nature Communications. To read the full paper click on the infographic below. Hakai Magazine's story "How British Columbia's Coastal People Fertilized the Forest" features our research on intertidal resource use published in Nature Communications this week. Click the image below to read the full story. 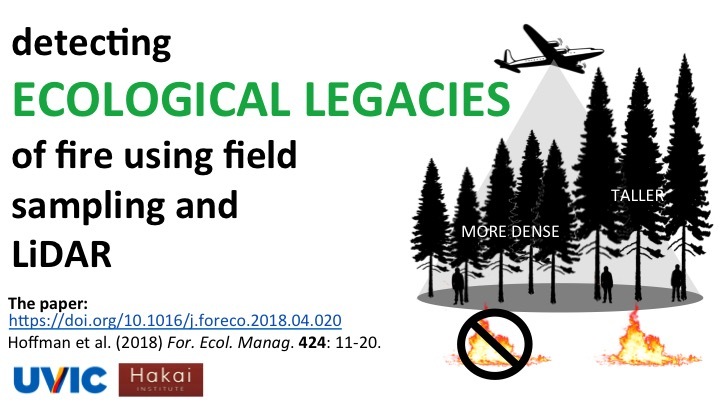 The Burning Bog is a mini documentary by Grant Callegari and the Hakai Institute on my fire history research on the Central Coast of B.C. A dinnertime conversation at the Hakai Research Station is "A Feast of Ideas" to Jude Isabella. Featured in the October 2014 edition of The Walrus. My field report about conducting research in bog ecosystems on Patagonia's blog, The Cleanest Line. My research on coastal bog ecosystems has also been featured by the University of Victoria.